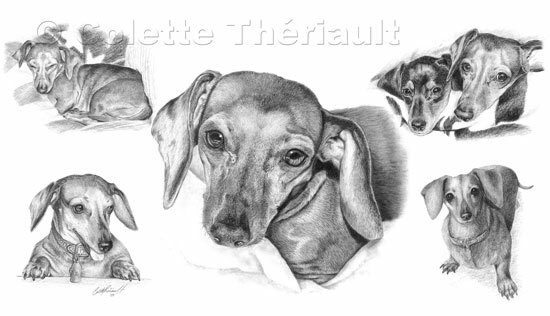 This commissioned montage portrait offers a glimpse into the life of Molly the mini dachshund. The top two poses represent Molly as what she did best...spending most of her time comfortably snuggled on a cushion or blanket as she snoozed for most of the day. The bottom poses depict Molly in a more lively mood; one at play and the other (full body pose) showing off the look she gave her master as she patiently waited for supper. The larger, more detailed middle pose shows off Molly sporting a sweet expression, all the while still cuddled in a blanket. 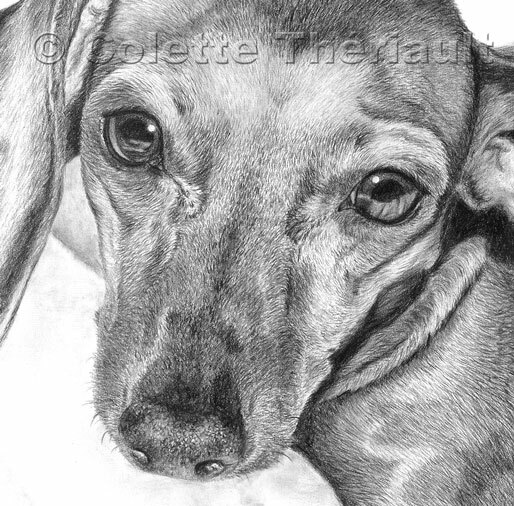 There is much more emphasis on her big, beautiful eyes and textured nose and the fine details of her soft, short and shinny fur. The blacker dog on the top right pose is Liebe, Molly's best doggie friend.